Despite domestic constitutional provisions and international treaty promises, Japan has no law against racial discrimination. Consequently, businesses around Japan display “Japanese Only” signs, denying entry to all “foreigners” on sight. Employers and landlords routinely refuse jobs and apartments to foreign applicants. Japanese police racially profile “foreign-looking” bystanders for invasive questioning on the street. Legislators, administrators, and pundits portray foreigners as a national security threat and call for their segregation and expulsion. Public rallies advocate the disenfranchisement – even killing – of foreign residents born and living in Japan for generations. Nevertheless, Japan’s government and media claim there is no discrimination by race in Japan, therefore no laws are necessary. How does Japan resolve the cognitive dissonance of racial discrimination being unconstitutional yet not illegal? Embedded Racism carefully untangles Japanese society’s complex narrative on race by analyzing two mutually-supportive levels of national identity maintenance. Starting with case studies of hundreds of individual “Japanese Only” businesses, Embedded Racism carefully analyses the construction of Japanese identity through legal structures, statute enforcement, public policy, and media messages. It reveals how the concept of a “Japanese” has been racialized to the point where one must look “Japanese” to be treated as one. This augurs ill for Japan’s future. With Japan’s low birthrate, aging society, and decreasing population, one hope for Japan’s revitalization, after more than two “lost decades” of economic stagnation, is immigration. However, if people (including Japanese citizens) face phenotypical barriers to integration and acceptance, then Japan will not be able to reverse its demographic decline by creating “new Japanese”. Thus, the systemic treatment of what the author calls Japan’s “Visible Minorities” is the “canary in the coal mine” for Japan’s future economic vitality and solvency. Summary of the book in The Japan Times, "Tackle embedded racism before it chokes Japan", November 1, 2015. "Recommended Reading" -- Dr. Jeff Kingston, Director of Asian Studies, Temple University Japan, writing in The Japan Times, December 19, 2015. [Embedded Racism] is a brave critique of Japanese society and its failure to look outward in its demographic and economic development. The book will, no doubt, add to a lively discussion already afoot in Japanese studies, critical race studies, and critical mixed race studies of racism in Japan. [...] The strongest part of the book, in my view, is chapter 5, which illustrates how "Japaneseness" is enforced through legal and extralegal means. The examples of visa regimes and even exclusion from sports and other contests through educational institutions show how everyday racism leaks into larger organizational practices, often without challenge. 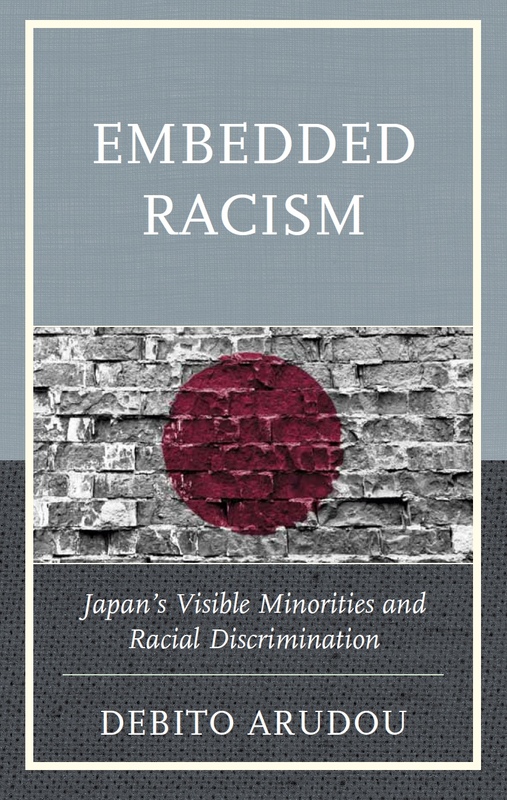 [...] The book is clearly written and seems to be aimed primarily at undergraduate students, as it makes an important contribution for those wishing to understand racism in Japan better, and it compiles interesting documentary legal data about the history of cases of discrimination in Japan. The book would easily suit courses that address global conceptions of race and ethnicity and how these are changing in Japan at both the micro and macro levels because of globalization. This book is the product of nearly thirty years of researching and living in Japan – from around the time I first visited in 1986 to the present day. I have always been intrigued by how some normalized images of Japan did not square with what I was experiencing in everyday life. Despite being friendly and hospitable to guests, very progressive in unexpected ways, and open enough to outside things to co-opt them (even the music for Japan’s national anthem was written by a foreigner), Japan has a palpable undercurrent of exclusionism. It is both subtle (e.g., ideas and proposals dismissed due to their “lack of precedent”) and overt (e.g., “No Foreigners Allowed” signs – the subject of my related book “Japanese Only”: The Otaru Hot Springs Case and Racial Discrimination in Japan). As I stayed longer, became fluent in Japanese, and felt acculturated and comfortable in Japanese society (to the point of taking Japanese citizenship and giving up my American), I saw the exclusionism more and more – and wanted to understand it. As a social scientist, I like figuring out why societies behave in patterns, i.e., “why people generally do this and not that”. I eventually arrived at answers that transcended the tautological “Japanese do this because they are Japanese”, i.e. something “cultural”. That was important to me. I never liked “culture” as an explanation, since a) “culture” is hard to define, and eclipses individual choice and foible, b) it is often a “black box” that encages researcher curiosity, and c) I assume that people anywhere are generally rational: they do things because those things are in their own best interests. I do not think people are unthinking “prisoners of culture”. In most cases there is a system – a collection of logics and incentives – that occasions behavior, in this research one that encourages people to behave inclusively or exclusively. Even if those belief systems initially made no sense to me, they made sense to someone. My quest in this book was to find out how they made sense, and to quantify how they were underpinned by rules, customs, mores, and procedures. Exclusionism in Japan (especially that of the racialized ilk) has been one big puzzle, taking me decades to deconstruct, and then to reconstruct as a coherent picture of why a society as kind as Japan’s can be so cold and unsympathetic towards people perceived as outsiders. One conclusion I would like readers to internalize from this book is that Japan should not be treated as “special” – again, that “Japanese do this because they are Japanese” thing. Succumbing to that narrative invites all sorts of exceptionalism that is ungrounded – and it causes enormous cognitive dissonance when Japan is called upon to observe (but, as we shall see in this book, officially claims exception from) the international standards of human rights under the international treaties it signed. This is not just a matter of normative principle. As I argue in the last chapter, Japan’s racialized nation-state membership processes are so exclusionary that they are undermining the very fabric of Japanese society: Japan is strangling itself demographically on its Embedded Racism. In sum, Japan is no exception, especially to the world’s racialization processes, and it deserves similar critique for racism. I believe that Japanese society behaves like any other – it just does it with an internal logic that is “special” and “unique” in ways that all societies are special and unique. This book seeks to unspool the internal logic that justifies and embeds racism. I hope you find its arguments compelling. Hardcover, November 2015 (North America, Latin America, Australia, and Japan), January 2016 (UK, Europe, rest of Asia, South America, and Africa), 404 pages, $110 list price (discounted to $70.00 from publisher direct; see below). NEW! Paperback version July 2016, $49.99 (=>discounted to $34.99 with promo code LEX30AUTH16 directly from publisher) in time for Fall Semester textbooks. Professors: Obtain an inspection copy and/or ebook from publisher at https://rowman.com/Page/Professors. Purchase from publishers Rowman & Littlefield directly: 30% discount with promo code LEX30AUTH16 => $77.00 (hardcover) or => $34.99 (Kindle or paperback) (click to download flyer with discounts). NB: International orders (i.e., outside of the US and Canada) can also order directly via orders@nbninternational.com and give the same promo code in the email. This will get you the book to Japan, for example, for about $40 including SAL postage within one week.